Bing Crosby (1904-1977) started his career in Paul Whiteman's orchestra as a member of the band's vocal trio, The Rhythm Boys, together with Al Rinker and Harry Barris. 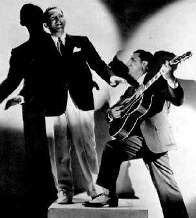 The Rhythm Boys were featured in numerous recordings and broadcasts with Paul Whiteman from 1926 to 1930 and also took part in the 1930 'King Of Jazz' film portrait of Whiteman starring members of the band. 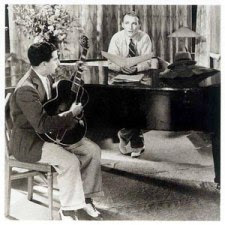 When Crosby left Whiteman starting his solo career as a singer in 1931, he would ask Eddie Lang, the band's famous guitarist, to accompany him on recordings, broadcasts and in film. 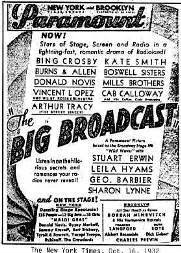 Lang, however, was only featured in a single movie together with Crosby, 'The Big Broadcast' from 1932. 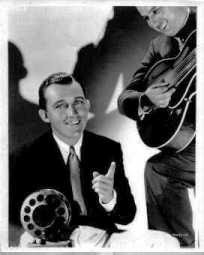 Bing and Eddie had become close friends during their cooperation in Whiteman's orchestra, and Bing encouraged Eddie to have a routine tonsillectomy before starring with extended spoken lines in his next film. Tragically, Lang died from complications of the operation and Bing was suddenly left without his great friend and talented sideman, a loss he would blame himself for the rest of his life.